Shaun Marsh could not get a Test run before he lost his place in the side, has four hundred in the last eight matches; MS Dhoni could not go past 50 throughout 2018- he now has back-to-back fifties at the start of 2019 including a vintage six of the last over to seal another run-chase at the Adelaide Oval. The fans think it is a rollback to 2009- their own version of #10years challenge- scoring runs then, scoring runs now. The fact of the matter is Marsh needs run to shave off the competition in the ODI side while Dhoni needs to get his mojo back as the clamor to bring Rishab Pant in the side tries to gather peek momentum. But the bigger picture for both sides lays elsewhere. India returns to the iconic Melbourne Cricket Ground- a place where they nearly sealed the historic Test series, Virat Kohli's side has a chance to complete a double on the troubled hosts. 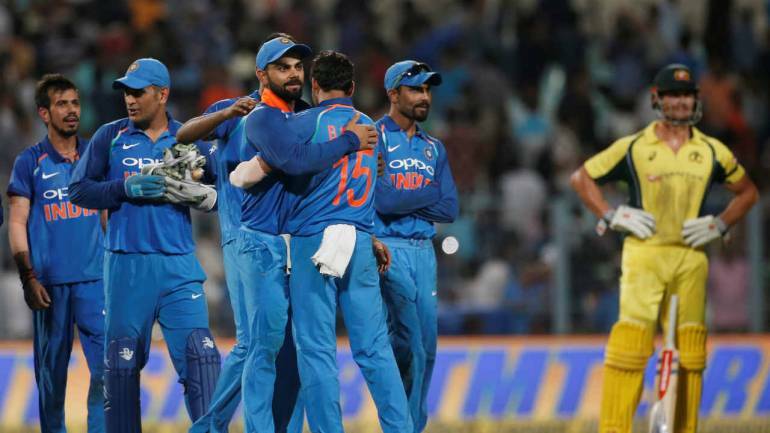 This is India's only second bilateral ODI series in Australia [they lost 1-4 in 2016], and a win will certainly be momentous in what has already been a legacy-defining tour. But, with the bigger picture of the World Cup in mind, India's primary objective should be to get their team balance right. Ambati Rayudu has not made the most of his opportunities in the first two matches and going by the revolving door that the side has placed for non-performers, the Andhra batsman place might be in jeopardy for the Melbourne ODI which means Dhoni and Karthik could one spot up. In Adelaide, due to a lack of a sixth bowling option, Kohli was forced to bowl out the expensive Mohammad Siraj. Rayudu's lack of runs and suspected bowling action, for which he was reported in Sydney could mean Kedar Jadhav or Vijay Shankar could come back into the fray. Once hailed as one-half of the spin twins, Yuzvendra Chahal's wicket-taking ability has dipped substantially- 13 wickets in 11 ODIs at 37.84 since June. He has played just one of India's last ten matches but with the MCG being a big ground, Kohli might be tempted to reunite the spin twins. But, it seems unlikely, considering the all-around value Ravindra Jadeja adds to the side. Mohammad Siraj had a forgettable debut and should make way for Khaleel Ahmed. The hosts, who are eyeing their first ODI series win since January 2017 have problems of their own. While skipper Aaron Finch is grappling with a lean summer, their inability to beef up their score past 300 in both the matches has put the focus on Glenn Maxwell's batting position. The all-rounder scored a 37-ball-49 in the last game and coach Justin Langer believes he is the right man for the No.7 spot which puts the onus on the likes of Marcus Stoinis and Peter Handscomb to up the ante in the middle overs. Unlike Adelaide, where the temperatures hovered around 41 degrees, the teams at the MCG will be greeted with a cooler climate with a maximum of 27 degrees and a low of 16. With drop-in pitches at the MCG, expect a true bounce for the fast bowlers while the big boundaries will also bring the spinners into play. India has a W/L ratio of 0.555 at the MCG, having won five of their 14 matches against the Australians at the venue. The Men in Blue are yet to win an ODI against Australia at Melbourne in this decade, having lost all of their three encounters. Rohit Sharma averages 68.00 against Australia at the MCG in four games, closely followed by Virat Kohli at 52.33 in three games. Of all the current Indian bowlers, only Ravindra Jadeja has played at the MCG. The off-spinner averages 45.00 in two matches. Shikhar Dhawan is only 33 runs away of completing 5,000 ODI runs. If he achieves the feat in the 3rd ODI, which will be his 117th innings, the Delhi batsman will become the fourth fastest to achieve the feat after Kohli , Richards  and Hashim Amla . Rohit Sharma (981 runs in 18 innings) needs just 19 runs to complete 1,000 runs vs Australia Down Under to equal with Viv Richards for the least innings taken. Australia- The hosts have made two changes to their playing 11 for the final ODI. Adam Zampa replaces GOAT Nathan Lyon, who went wicketless in the last two games while Jason Behrendroff [sore back] makes way for Billy Stanlake. India- India might look to beef up their line-up with a sixth-bowling option which brings the likes of Kedar Jhadav and Vijay Shankar into the fray. Khaleel Ahmed is expected to return after Siraj's forgettable debut at the Adelaide Oval.